In addition to its Jews, gypsies, mentally ill, and gays, Nazi Germany decided to rid its homeland of the “alleged horrors” perpetrated by its own writers and artists. Specially chosen “experts” plundered Germany’s museums and private collections and confiscated, sold and mostly destroyed thousands of modern and expressionist art works. To teach their minions to recognize such “abominations,” the authorities organized a mammoth exhibition of “Degenerate Art” in July 1937. The Nazis did not succeed in silencing German Expressionists and other artists. Today their messages as well as those of the closely associated Bauhaus are venerated. In March 2014, the Neue Galerie in New York mounted a small exhibit to remind of these events. (In 1991, LACMA and the Art Institute of Chicago mounted a much more substantial exhibit.) The current exhibition at the Neue Galerie is nevertheless impressive because it integrates the paintings with philosophy of the Third Reich. Photo murals contrasting the lines of visitors to the exhibit of degenerate art are juxtaposed with Jews about to be slaughtered in Auschwitz. Elsewhere Dresden, a center for modern art, is shown before and after its firebombing. My average upper-middle class German Jewish family was much involved with modern art in Germany. They bought the then very affordable contemporary art, and were avid clients of the Bauhaus. My uncle Otto Bamberger had a sizable collection that included a large Kneeling Woman by Wilhelm Lehmbruck, oils and hundred’s of works on paper. After his widow fled to America, hoodlums sacked his villa in Lichtenfels and most of the art has not been heard of since. My mother too was a small art collector. I was pleased to find out that she had been savvy enough to acquire a small statue by Ernst Barlach and a pastel by Christian Rohlfs (works of both artists are included in the show at the Neue Galerie.) The Barlach, together with an enormous Georg Grosz oil, got lost in Brussels during World War II. The Rohlfs, which she bought from the artist, hangs in my Brooklyn living room. My favorite rescued work, however, is a large double portrait of Francesca da Rimini and Paolo Malatesta, whose unfortunate tale is part of Dante’s Inferno. Their story was beloved by many painters including Dante Gabriel Rosetti, Gustave Doré and Dominique Ingres. Hermann Lismann (1878-1943), a forgotten German Expressionist, painted my version in 1923. Its vivid, primary colors lighten my apartment on dark days. The work is an amazing cross between early Picasso and the flat, elongated style of Amedeo Modigliani. Lismann never made it big. He worked in Frankfurt at the university and for the municipal museum until dismissed as a Jew. He was a prolific painter, but his works were dispersed and destroyed during the Nazi era. Lismann fled to France in 1938. Arrested in 1942, he was first sent to the Gurs concentration camp in southern France—where my own father was detained from 1940-41. Two years he was murdered in Majdanek. The story of the art lost during the Holocaust is still very much alive. The story of Hildrebrand Gurlitt and his son Cornelius surfaced in early 2014, long after the people who owned and cherished these works are gone. In honoring the painting by Hermann Lismann, I hope to pay a small tribute to his genius and the immense tragedy of his life. 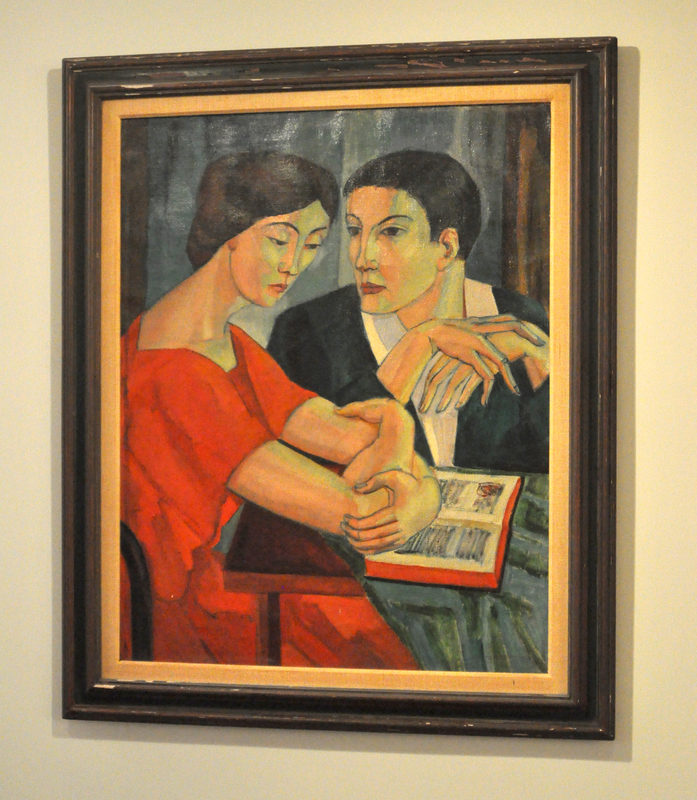 The Neue Galerie exhibition continues until June 30, 2014. This entry was posted in Art review, family stories and tagged art, bauhaus, christian rohlfs, cornelius gurlitt, current exhibitions, dante alighieri, dante's inferno, degenerate art, degenerate art exhibition, divine comedy, ernst barlach, francesca da rimini, georg grosz, german expressionism, german expressionists, german jews, hermann lismann, hildebrand gurlitt, holocaust, modern art, nazi germany, neue galerie, nyc art exhibits, nyc exhibits, nyc museums, paolo malatesta. Bookmark the permalink.